Why Do We Still Need This Ancient Math Skill? Posted by Dad on February 7th, 2017 in Calculator, Roman Numerals Add Your Thoughts! Radians or degrees, fractions or decimals… There are a lot of places in math (and definitely in other topics) where you can make a case for representing measurements in different forms. But Roman numerals versus Arabic numerals, there you’ve got a much more compelling argument for letting the sands of history wear away at this 2,000 year old numbering system whose main claim to fame seems to be keeping track of how many times a certain prominent football game has been played (51, or Roman numeral “LI”, as of this post in case you’re curious.) Go ahead and disagree with me, and I’ll be assigning you some Roman numeral multiplication worksheets… We’ll see who gets the last laugh there! Still, Roman numerals pop up in a number of odd spots unexpectedly and that makes at least knowing how to read them a necessary skill. You’ll bumble across them on traditional analog clock faces, page numbers for those pesky prefaces in books, that weird outline mode in Microsoft Word, and the “IV” at the end of your buddy’s name when his parents, grandparents and great-grand parents couldn’t think of a new first name besides “George” when the baby came. Any place where somebody wants to lend a certain historical gravitas, there too shall ye find Numeris Romanis. Give it a try and let me know what you think, and for more Roman numeral resources be sure to check out the Roman numeral charts on the site as well! Young, Old or In-Between… You Know You Need to Know Your Age Down to Second! Posted by Dad on December 13th, 2016 in Calculator Add Your Thoughts! Have you ever wondered EXACTLY how old you are? Or how close you are to your next birthday? Or exactly how far apart in age you are from someone you know? Or whether your 52nd birthday is going to be on Monday or a Tuesday? Come on. You know you need to know. These are fascinating questions, not just for kids but adults too. While you and I may be hoping our birthday is just a little further away while at the same time our kids are literally counting down the days before they get to rip open more presents, our fascination with dates is the same. We all want to know when and where the time goes and how long until we get there. Enter the new Age Calculator! Give it a spin and it’ll tell you the answer to all of the questions above, plus provide facts like what day of the week your birthday lands on (past, present and future), your astrological sign and more. Hover the cursor over the events in the calculator and you’ll get more details about each individual event, and you can use the arrows at the top and bottom of the display to scroll the calendar forward and backward in time to see more events. If you make a selection in the lower part of the Age Calculator, you can look at other age-related events. Ready to settle that whole, “I’m so and so months older that you, so I know better than you…” argument definitively? Want to compare your age to a friend? Or your brother or sister? Or, (at your own risk) your spouse? Try the “Friend’s Birthday” function in the calculator and you’ll be well armed. Curious about the next U.S. Presidential Election? 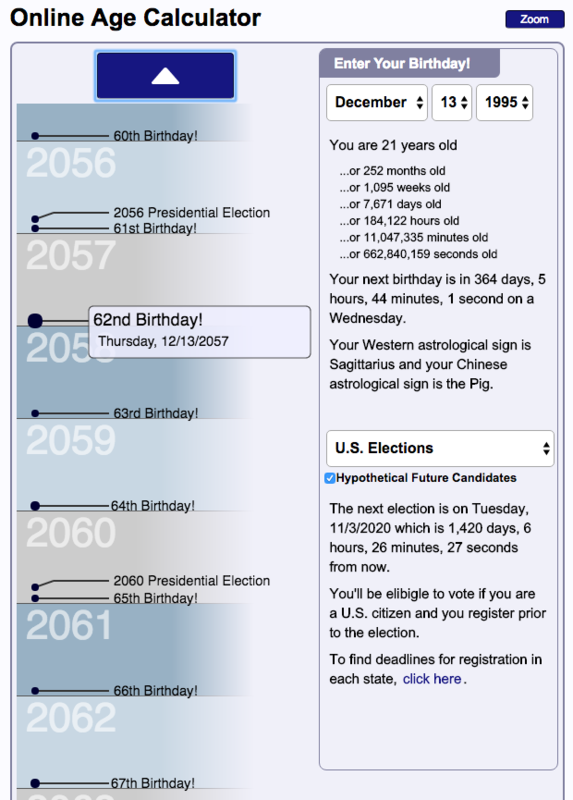 The calculator will tell you when it will happen, and whether you’ll be eligible to vote or not. And, for future elections, I’ve taken a stab at a few possible candidates. I mean, up until the robots take over everything, at that point I’m not sure we get to vote anymore. Want a quick and easy way to see how much money you need to save, and how much that money is worth in today’s dollars? The “Savings Calculator” function will let you specify an amount, investment frequency, rate of return and inflation rate. You can get a detailed breakdown of the investment over time by hovering over dates in the calendar part of the calculator, but you’ll get a ten year summary right in the age calculator’s display. No matter what you use it for, this Age Calculator is a lot of fun to play with. I hope you’ll use it with your kids to talk about ages, birthdays, calendars and this whole passing of time thing. If you use it in your classroom, drop me a note in the comments and let me know what you did and how it worked for you, or if you just found it interesting please share it with your friends! More Updates to the Amazing Fraction Calculator! Posted by Dad on October 6th, 2016 in Calculator, Fractions Add Your Thoughts! I’ve received so much positive feedback on the fraction calculator and I really appreciate everyone who’s taken the time to pass along comments and suggestions! 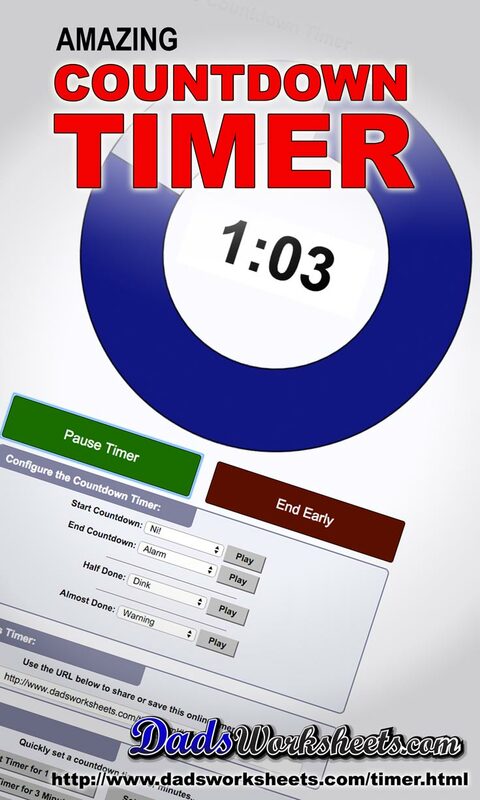 If you haven’t had a chance to play with it, please check out the new and improved version! One thought that came up from users repeatedly was the way the previews represented mixed fractions was a little unintuitive given that the whole part of the fraction was always shown as a numeric value but the fraction had the pie-chart representation. And the concepts didn’t related particularly well to the multiplication and division operations. To make the preview a little more useful in an instructional setting, I’ve updated it now. In general, small mixed fractions will be shown entirely as pies, with the wholes being shown as one or more complete pies divided by the numerator. If there are more than five wholes, the calculator’s representation reverts back to it’s numeric mixed fraction form. What this accomplishes for addition and subtraction calculations is to make the representation totally visual, which is much closer to the vision I had in creating this thing. Now multiplication and division are slightly different beasts, and in the context of the fraction calculator trying to show a meaningful visualization of how the operands translate into the product or quotient, my friend Maria Miller suggested that the right approach was really to express the multiplicands as a visualization times a number (or the dividend divided by a numeric divisor representation for division) since these operations didn’t lend themselves immediately towards the sort of counted forms that addition and subtraction do. If you think about it, this makes sense because these operations are more about repeated operations (multiples of or divisions into) a value, and the visualization of two separate fractions could almost be misleading. Either way try it out with a whole multiplicand or a whole divisor and I think you’ll find the preview is conceptually at least much better. I still have plans to add steps the calculator is taking to generate the solutions, so for example a break down of how common denominators are determined or how the final mixed fraction might be reduced. It’s definitely a work in progress, but even now I think you’ll agree the calculator is already one of the best fraction teaching tools online! Posted by Dad on August 9th, 2016 in Calculator Add Your Thoughts! Prime factorizations are a great tool for figuring out greatest common divisors (or largest common denominators if that’s how you swing), or for finding the least common multiple. But naturally, this calculator will tell you quite promptly if a number is prime as well. Posted by Dad on April 1st, 2016 in Calculator, Fractions Add Your Thoughts! Percentages are an important part of both math and daily life. We deal with percentages all over the place… Calculating tips, 50% off sales, sales tax, or (dare I mention it in April?) income taxes. All of these areas work with percentages. 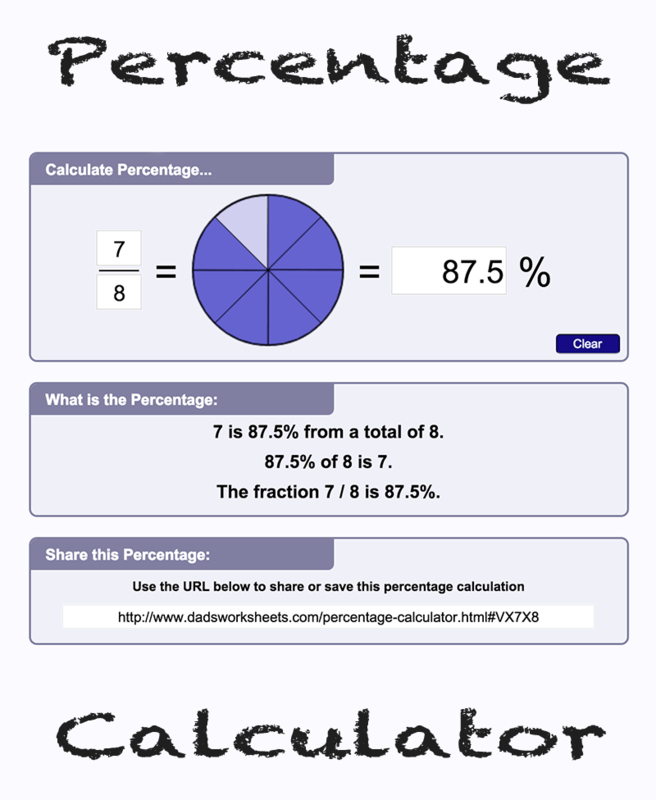 This percentage calculator easily allows you to convert a percent to fraction or, in reverse, a fraction to percent. By playing with the various values, you can work out various types of problems (“what percent of a number is some other number” for example), and the spoken-word version of various types of problems is shown in the preview. Working various problems through the calculator will quickly build experience with various types of percentage problems. Also be sure to check out the various fraction and percentage math worksheets on the site for more practice. Free Pie! And an Amazing Fraction Calculator! Posted by Dad on February 1st, 2016 in Calculator, Fractions Add Your Thoughts! Sometimes, it’s really just all about pie. Who gets how much pie. How many pieces of pie. Fractions of pies. Big fractions for me, please. When you are learning how to add or subtract fractions, it’s easy enough to get the whole common denominator thing figured out. I mean, if Uncle Billy ate half of the cherry apple, you know you’re only going to have a third of the pie left after you take your traditional one sixth slice. Denominators of two and three and six… It’s just basic pierithmetic. But multiplying and dividing, that requires skills. Serious skills. And that’s where this fraction calculator might come in handy. Whether you have to deal with mixed fractions or improper fractions, or if you just need a little help with the core operations on simple fractions, this calculator is built just for you. It will reduce and simply anything you put into it, and along the way give you a visual preview to help show what’s going on. Check out the YouTube video in this post for a quick demo, or just go straight to the link below. Also works great for pizza. Because, you know. Pizza is a pie, too.